By Derek Clouthier, LETHBRIDGE, Alta. – The Alberta Motor Transport Association (AMTA) outlined its Top 10 advocacy initiatives for 2019, with super singles, Level 8 inspections, and mandatory entry-level training (MELT) at the forefront of the list. 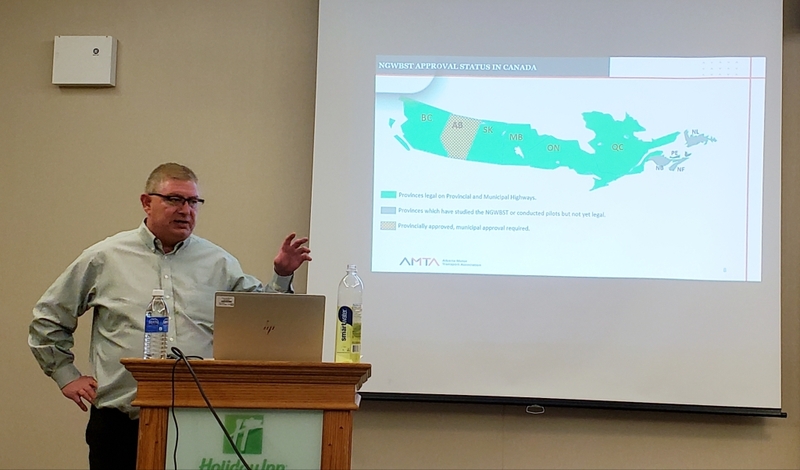 Andrew Barnes, director of the AMTA’s Compliance and Regulatory Affairs (CRA) department, highlighted the association’s goals during a regional meeting in Lethbridge, Alta., Jan. 28. Starting with new generation single wide base tires, Barnes said the AMTA’s pilot project with Alberta Transportation revealed 8.5% improved fuel economy during the year-long study. “Not only are we saving fuel, but we have a hand in GHG reduction, which is good for everyone,” said Barnes, adding that during the testing, there were no incidents or negative impacts from the use of super singles. The lifespan of super single tires is slightly lower than duals, dropping from 20 years to 19.2. There is, however, reduced waste with super singles, as there are less tires being disposed. Super singles are permitted on provincial highways, but not currently on municipal roads. The AMTA is looking for support from the province and City of Calgary to allow super singles on designated truck routes, which would bring Alberta in line with B.C., Saskatchewan, Manitoba, Ontario, and Quebec. MELT has long been an AMTA initiative, an effort that has been thrust into the spotlight following the Humboldt tragedy. In addition to supporting the provincial MELT program set to kick in this spring, the AMTA would like mandatory National Safety Code (NSC) training for all new carriers in Alberta. The training would focus on carrier responsibilities, liabilities, and performance expectations. The AMTA wants to see third-party NSC audits completed within the first four months for new applicants. Barnes also said Safety Fitness Certificate (SFC) audits and renewals should be completed by a third party every three years at the cost of the carrier. Harmonizing hours-of-service (HOS) is another objective of the association. With Alberta currently operating under federal or provincial regulations, Barnes said there can often be confusion for carriers, drivers, and commercial vehicle enforcement. “We would like to see the province of Alberta adopt the federal HOS at 4,500 kg as per the federal HOS legislation,” said Barnes. The ATMA believes harmonization of HOS would increase safety and level the playing field for federal carriers that cannot compete with provincial carriers operating with more on-duty hours. Closely tied to HOS, Barnes urged carries still using paper logs to make the transition to ELDs before the June 2019 deadline. After a brief grace period where ELD enforcement will take an “educational” approach to ensure carriers, drivers, and CVE officers are up to speed, full enforcement is set to begin in the third quarter of 2020. Level 8 inspections was another issue near the top of the AMTA’s advocacy list. Level 8 inspections occur when a carrier passes through an electronic inspection and receives results without having to interact with an officer. Barnes said the AMTA would like to see movement on Level 8 inspections, as in most cases, many carriers are only being inspected when a defect is found. Currently under review by the Canadian Trucking Alliance and Commercial Vehicle Safety Alliance (CVSA), the AMTA wants Level 8 inspections added to a Carrier National Safety Code profile. Carriers would then get credit for passing the inspection. With efforts like MELT and SFC audits intended to bring more professionalism to the truck driving profession, Barnes said being recognized as a skilled trade would help carriers tap into the Temporary Foreign Worker Program to find quality drivers. As Barnes explained, the driving profession has been opened temporarily to bring workers in though the foreign worker program. The AMTA would like to see this become permanent. Barnes said there needs to be increased efficiency in processing applications for truck drivers, and the number of drivers permitted through the program must increase to meet demand in Western Canada. Carriers can help the driving profession be recognized as a skilled trade by ensuring job advertisements reflect the skills required to be a commercial vehicle operator. On the infrastructure front, rest stops are desperately needed in Alberta, said Barnes. Barnes said there are currently only three fully-equipped rest stops in the province, but a potential solution could be on the horizon. The AMTA is aware of a third-party consortium willing to design, construct, finance, operate, and maintain a commercial safety rest area network. The group is willing to build 15 fully-equipped rest stops throughout the province, at no cost to taxpayers. Another infrastructure aspiration for the AMTA is to continue advocating for upgrades to Alberta’s highway network. Barnes said the association has had several wins when it comes to road upgrades – such as a 19-km stretch of Hwy 40 south of Grande Prairie – and is in conversations regarding the safety and capacity of Alberta’s North-East corridor connections (Hwy 2, 16, 43, 63, and 881). The AMTA would like to see the province’s northeast region identified in the CanAmm, PanAm, or CANAMEX trade corridors to reflect its importance to Alberta’s economy. Rounding out the AMTA’s Top 10 list was the implementation of new technologies to be used on Alberta’s roads through testing and research of autonomous vehicles, alternative fuels, and improved components. Irregularities with regulatory interpretations are another area the AMTA would like to iron out in 2019, with improved communication between Carrier Services and the industry. As was LCV breakups and tractor switches. Barnes said the AMTA understands the danger in doing breakups and switches on the side of the road, and said safer, more adequate facilities are needed.